"We have a great comfort level dropping Chase off at school each morning, knowing that he will learn something every day that can be used to open new doors in life." "Since starting at Open Wings four months ago, Henry is a new child. He loves school, even becoming upset when his Grandmother mentioned a possible snow day." "Through a personalized educational plan and a positive environment, this school is able to achieve success where all other learning institutions fail." "Open Wings Learning Community has created a positive educational future for my Grandson Logan, a future that could not be realized in any other learning institutions within our community." "Because he's so happy and feels accepted, he is a joy to be around. Open Wings has been a miracle for our family." "She is now getting an educational experience that is customized for her, and she now has a confidence that we have never seen before. She initiates socially now with her peers, and has a social life that warms my heart to its fullest." "The ultimate compliment to any school is to feel the confidence that your child is in great hands. Since day one, when we took Chase to school we left him, with no anxiety or worry." "Our goals for our son are no different than those of any typical 8-year-old boy. Our path is longer and certainly slower but with the help of Open Wings we are making progress." "Getting a sentence out is sometimes such a victory for some kids that to know that the sentence will be heard in a world that moves so fast is immeasurably valuable. We are grateful that the Open Wings team hears our daughter and validates her voice." "Autism does not define her... the word is rarely ever spoken any more... Instead, she is defined as an artist, a lover of music, and horse girl. She is a friend and a sister. She is a daughter and granddaughter... She is so much more than a label." 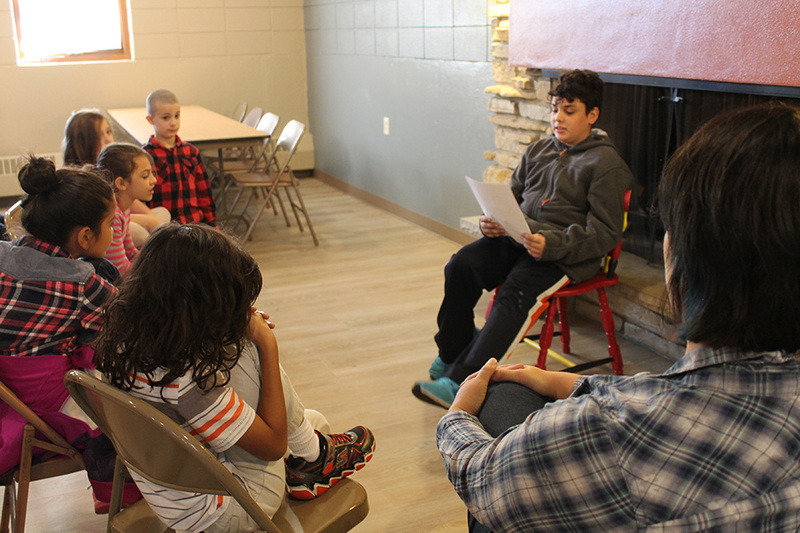 "Open Wings has done wonders for Josh by providing a rich venue for language stimulation through peer interaction and self-expression." "Anneliese would thrive in most any classroom, but what we see as a result of her experience at Open Wings is not just growth in her academic ability, but her ability to solve problems and share with her peers and teachers in deeper and more meaningful ways." "In Open Wings, his growth has been exponential. We’ve seen a proliferation of words and phrases, some of them figurative to describe the weather, the night sky, events, and all things other than food and his physical needs." "There are no words that can express how proud I am of him for never giving up. He has come so far in the last year. He is reading, writing, and learning to express himself." "All of this conversation is now possible because of the longstanding commitment and patience of the teachers and therapists at Open Wings. Don't believe Gabriel when he says he's the villain; he's a hero for coming so far, and Open Wings is his magic." "If it weren't for Open Wings I'm not sure we would be seeing the girl we see before us now and for that my family and I thank you, Open Wings, for giving our daughter the tools needed to become more amazing than she already was." "She has always been talented and gifted in our eyes but Open Wings has shown her how to blossom in every one else's eyes..."
"I love watching him learn and grow in this amazing school!" "Ainsley loves school and wants to go every morning. She truly wants to learn and be in community. She loves her friends and learns so much by observing them. Her friends value her as unique and her own person." "...he needs to consider all aspects of an activity before comfortably participating. The teachers have worked with him on that, respecting his need to understand everything before moving on." "They just have the keys she needed to unlock it." "She is treated with respect by educators and students. Everyone she encounters in a day maximizes on her strengths." "Through Open Wings, Sam is developing a strong sense of self so that he can know and develop what God has given him!" "... and most of all he was loved." "Socially Maddux is not only participating more with his friends, he is now initiating interactions. This is a huge gain. He has gone from not being involved at all to seeking out the attention of his friends and teachers." "We were encouraged to look into Open Wings Learning Community last spring and it was the best decision we made for Hallie to date." "She needed Open Wings’ staff to bring that potential out, and I am EXTREMELY indebted to the school for investing in her." "I don't know where we would be if I didn't find this wonderful school." "The Staff and students accepted her as part of the family and they see her for who she really is: a kind, shy, loving little girl that just needed friends and teachers who believed she was capable of growth."